A frozen yogurt shop specialising in vegetarian & vegan based desserts and drinks. By working with the best in the industry, we are able to offer the best frozen yogurt product on the market. We have come up with recipes that caters for a wider customer base. With finest ingredients and unique recipes, we have created a delicious and healthy treat for all to enjoy. We offer a great variety of yogurts, toppings, smoothies and hot & cold beverages. Not only are our products FAT FREE, they are LOW IN SUGAR, LOW IN CALORIES and full of ACTIVE LIVE CULTURES. These are a few things which other frozen yogurt lack and also desserts that often contain artificial ingredients or high calories from fat and sugar. Our brand is original and fun, with each store having its bespoke decor and design. Enjoy the Frurt experience with friends, family and loved ones. No weighing & fill as much as you can eat. 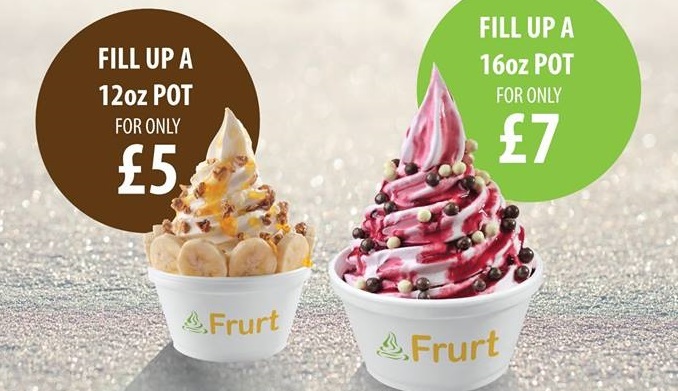 Fill up a 16oz pot and only pay £7.